NBA champion who holds down the middle for his Motor City squad. No one is going to mistake any of these high school seniors with their play-alike NBA counterparts, but here is the best shot at comparing these duos. Sure, there are the obvious comparisons that go beyond playing style and leak into the bloodlines. Robeson's high-impact guard Jeremy Pargo is strikingly similar to a fellow Chicago player that plays about 15 minutes north on Interstate 90/94. The only thing is, this player doesn't perform in a gymnasium but in a 21,711-seat arena along Madison Avenue -- The House That Mike Built. Jannero Pargo, 24, is a reserve guard for the Chicago Bulls in his third year in the NBA out of Arkansas. The Older Pargo also came out of Robeson, but, surprisingly Jeremy is playing with more hype than his brother had when he was prepping under long-time Public League coach Charles Redmond. Another brother tandem is Rich Central's Jarvis Walker and the Dallas Mavericks Antoine Walker. Antoine, 27, is a 1994 graduate of Chicago Mt. Carmel and while Jarvis began there, he has made his trek to Bremen and now will finish at Rich Central in Olympia Fields. Both are versatile big guys, but where Antoine, at 6'9", is a power forward, Jarvis will likely have to play the two-guard or small forward position on the next level at a more diminutive 6'4". The state's top prospect, Julian Wright, is a lanky performer capable of hurting a team in a variety of ways. 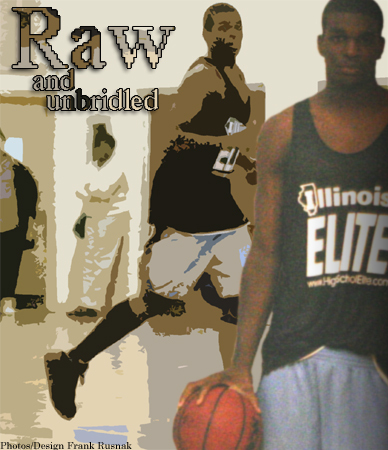 His performances draw comparisons to a former Illinois prep baller, Darius Miles. Both are all arms and legs, but versatile enough to direct the team at the point guard position despite towering over the opposition. Miles, now with the Portland Trail Blazes, led his team to a third-place finish at the Class AA state tournament four years ago. Wright topped that last season leading Homewood-Flossmoor at the state tournament with peerless performances where his Vikings eventually fell to Peoria Central in the title game. One of the hottest prospects in the state has risen to be considered one of the state's best just about as quickly as Carmelo Anthony did so to prove he is one of the NBA's hottest stars. Leyden's Marcus Green has a power forward body with a small forward's skills. Both Anthony and Green have Bounty-soft touches on their shots, are crafty at getting to the hoop and definitely are very capable finishers with highlight-reel plays when they get to the cup. Here are other prep players who have comparable games, styles and, in some cases, similar bodies to individual NBA players. Matching up some of Illinois' top seniors with their play-alike counterparts in The League. Sead Odzic WG Niles West Peja Stojakovic (Sacramento Kings) Quick releases on perfected shots that are comparable to few others. Grant Surprenant WG Palatine Reggie Miller (Indiana Pacers) Slight in frame but crafty in scoring with long-range marksmanship. Aaron Jimenez C Leyden Vlade Divac (Sacramento Kings) Both have a shaggy style to them, aren't flashy and get the job done with grit and smarts. Howard Boone PF Oak Park Ben Wallace (Detroit Pistons) Lacking in offensive skill, athletic frames are top tier and known for defensive prowess. DeAndre Thomas C Westinghouse Shaquille O'Neal (Los Angeles Lakers) When they get touches and stay out of foul trouble, few can stop them one-on-one. Emanual Gator WF Waukegan Ron Artest (Indiana Pacers) Versatile performers that use their body to wear on smaller opponents. Nate Minnoy PF Hales Franciscan Charles Barkley (Former NBA player) Undersized but versatile and have uncanny strength to still dominate down low. Marquis Young C Austin Jamaal Magloire (New Orleans Hornets) Both can be a force on the boards and each have the high hung shoulders and long arms. D.J. Posley PG Homewood-Flossmoor Sam Cassell (Minnesota Timberwolves) They have mastered the mid-range game and play the game with supreme wisdom. Tony Freeman G St. Joseph Tony Parker (San Antonio Spurs) Small point guards that have a scorer's streak within and can let it out at anytime. Bryan Mullins PG Downers Grove S. Jason Kidd (New Jersey Nets) Consummate point guards with unreal court vision and inconsistent outside shots. Angel Santiago PG Von Steuben Steve Francis (Houston Rockets) Athletic point guards that play with high energy and are fearless taking it to the hoop. Pat Nelson PF Rockford Jefferson Tim Duncan (San Antonio Spurs) Both play mechanically and with little flair, but produce with solid results. Tyrone Evans G East Aurora Michael Redd (Milwaukee Bucks) Quick catch-and-shoot players that are big-time scorers with an arsenal of moves. Jeremy Moss WG Centralia Ray Allen (Seattle Sonics) Athletic players who thrive on the fastbreak; 3-point shots streaky but can catch fire. Phillip Perry WG Proviso East Juan Dixon (Washington Wizards) Crafty scorers that can light you up in a variety of ways, both have a similar lanky build.